The Graduate Program of the Department of Chemistry offers master’s and doctoral degrees in chemistry, with a solid foundation in the areas of inorganic chemistry, physical chemistry, organic chemistry and analytical chemistry. The program has been turning out qualified professionals for more than 40 years, during which time it has also been active in pushing back the boundaries in many more specific areas with an interdisciplinary approach to the different branches of chemistry including organic and inorganic synthesis, catalysis, molecular biology, natural products, biotechnology, liquid crystals, and nanotechnology. 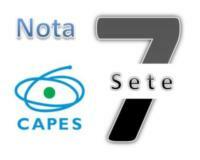 It is these factors which place our department at UFSC among the top chemistry graduate programs in Brazil, according to the regular ratings of the overseeing and funding government agency CAPES (Coordenação de Aperfeiçoamento de Pessoal de Nível Superior), which currently awards our program with the maximum grade of its tri-annual evaluation of graduate programs.